Weightier Matters: Demos Shakarian's Armenia(Full Gospel Businessmen's Fellowship Founder) Marks Centenary of Mass Killings by Ottoman Turks. Demos Shakarian's Armenia(Full Gospel Businessmen's Fellowship Founder) Marks Centenary of Mass Killings by Ottoman Turks. How The Tragedy was Prophesied in 1855 by a Russian "Boy Prophet"
Ceremonies are being held in Armenia to mark the centenary of the start of mass killings of Armenians by Ottoman Turks. The presidents of France and Russia joined other leaders at the memorial for the victims on the outskirts of the capital, Yerevan. Armenia says up to 1.5 million people died, a figure disputed by Turkey. Turkey strongly objects to the use of the term genocide to describe the killings and the issue has soured relations between the nations. Turkey accepts that atrocities were committed but argues there was no systematic attempt to destroy the Christian Armenian people. Turkey says many innocent Muslim Turks also died in the turmoil of war. Turkey is on Friday also hosting ceremonies to mark the 100th anniversary of the start of the Battle of Gallipoli. 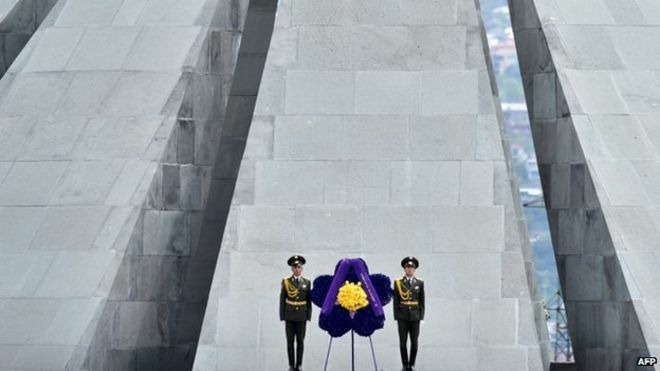 However, the actual fighting there began on 25 April, and Armenian President Serzh Sargsyan has accused Turkey of "trying to divert world attention" from the Yerevan commemorations. 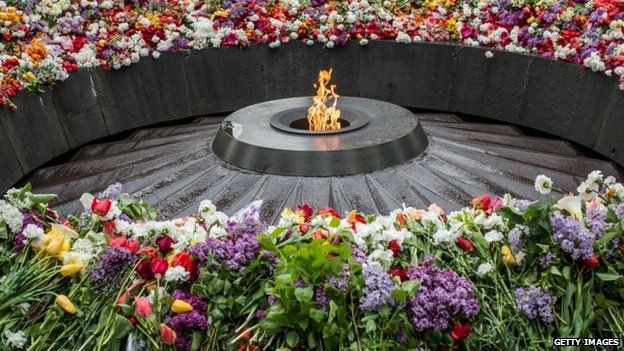 After the flower-laying ceremony in Yerevan, Mr Sargsyan addressed the guests, saying: "I am grateful to all those who are here to once again confirm your commitment to human values, to say that nothing is forgotten, that after 100 years we remember." The purple forget-me-not is the symbol of the centenary. It can be seen everywhere in Yerevan: from window shops and windscreen stickers, to lapel pins that many are proudly wearing. There is also a centenary slogan which reads "I remember and demand". But what is it that the Armenians are demanding? I asked some of the people in Yerevan's Mashtotz Avenue. "We demand fairness from the world community, that's it," said Sergey Martirossyan, "but for me personally it won't make any difference. What we actually need in Armenia is for the government to take serious steps towards economic growth." 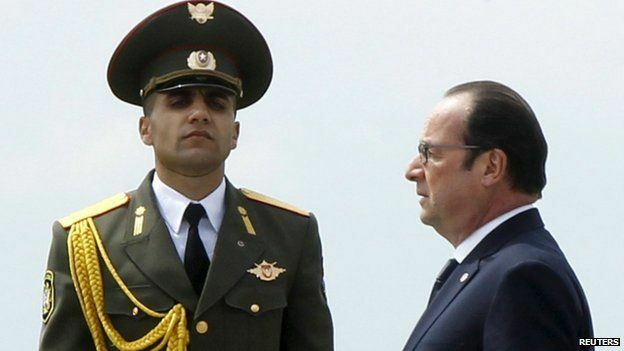 French President Francois Hollande said: "We will never forget the tragedies that your people have endured." Friday marks the 100th anniversary of the day the Ottoman Turkey authorities arrested several hundred Armenian intellectuals in Constantinople, today's Istanbul, most of whom were later killed. The BBC's Rayhan Demytrie in Yerevan says the Armenians regard this as the beginning of the Ottoman policy of mass extermination of Christian Armenians suspected of supporting Russia, the Ottoman Empire's World War One enemy. 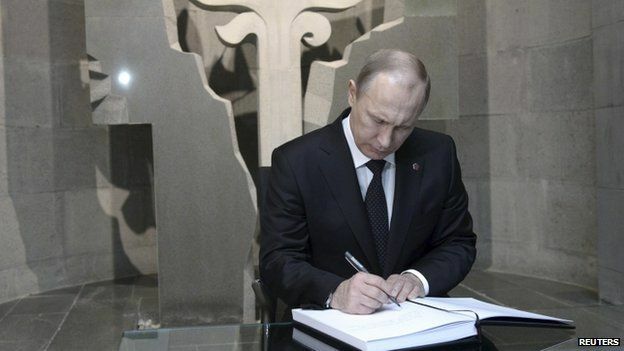 Russian President Vladimir Putin is also among those attending the ceremonies. US President Barack Obama issued a carefully worded statement for the anniversary, referring to "one of the worst atrocities of the 20th Century", without using the term genocide. During his 2008 presidential election campaign, then senator Obama had vowed to "recognise the Armenian genocide" and in his new statement said: "I have consistently stated my own view of what occurred in 1915, and my view has not changed." However, his phrasing has angered Armenian Americans. Bryan Ardouny, executive director of the Armenian Assembly of America, said in a statement: "President Obama's exercise in linguistic gymnastics on the Armenian genocide is unbecoming of the standard he himself set and that of a world leader today." On Thursday the Armenian Church canonised the 1.5 million people it says were killed in the massacres and deportations. It said it wanted to proclaim the martyrdom of those who died for their faith and homeland. After the ceremony, bells tolled in Armenian churches around the world. Also on Thursday, German President Joachim Gauck described the killings as genocide, on the eve of a debate in the German parliament on the issue. Earlier this month, Turkey recalled its envoy to the Vatican after Pope Francis also used the word genocide in a reference at a Mass at St Peter's Basilica. France has been a strong advocate of recognising the killings as genocide and President Hollande has pushed for a law to punish genocide denial. The issue has strained Franco-Turkish relations. Hundreds of thousands of Armenians died in 1915 at the hands of the Ottoman Turks, whose empire was disintegrating. Many of the victims were civilians deported to barren desert regions where they died of starvation and thirst. Thousands also died in massacres. Armenia says up to 1.5 million people were killed. Turkey says the number of deaths was much smaller. 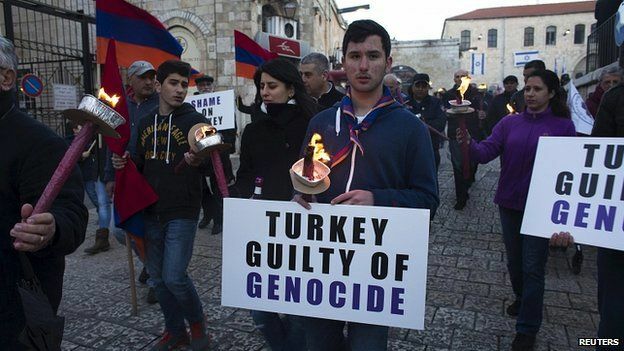 Most non-Turkish scholars of the events regard them as genocide - as do more than 20 states, including France, Germany, Canada and Russia, and various international bodies including the European Parliament. Turkey rejects the term genocide, maintaining that many of the dead were killed in clashes during World War One, and that many ethnic Turks also suffered in the conflict. The Tragedy was Prophsied in 1855 by a Russian "Boy Prophet"
Demos Shakarian (21 July 1913 – 23 July 1993) is one great story out of this tragedy. He was a Christian businessman of Armenian origin from Los Angeles who founded the Full Gospel Business Men's Fellowship International (FGBMFI). He was named after his grandfather, who left Kara Kala in Armenia for America due to the 1855 prophecy of the Russian "Boy Prophet", Efim Gerasemovitch Klubniken, that an unspeakable tragedy was to soon come upon Armenia, and he was part of a large group of Pentecostal Christian Armenians who moved to Los Angeles years before the Azusa Street Revival. .
His story and the story of FGBMFI is the subject of the book The Happiest People on Earth, written by John and Elizabeth Sherrill (Guideposts Magazine) and published in 1975. Demos Snr died while working on the construction of railroads in Nevada, and his young son Isaac became the head of the family. Isaac married Zarouhi Yessayian, and he became a prosperous dairy farmer. Demos Jnr entered the family business and their milk herd grew to become the largest in the world at the time.